My first garment of 2013 is this super easy A line skirt from the Sew U book. I highly recommend this pattern, but then you can't really go wrong with a basic A line skirt. I wanted a simple pattern so I wouldn't disrupt the embellished detail at the hem. I am really glad I did because I haven't done a great job pattern matching at the side seams, though to be fair this was due to the limited amount of fabric I had. When I saw this lovely soft baby cord in Leon's (the best fabric shop in the North). I knew it would be perfect for a Boden style skirt. 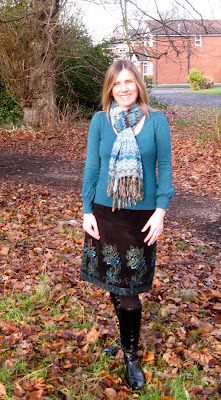 What is more, a Boden embellished A line skirt retails for around £60, whereas my skirt length was only £6! As I already had the pattern, some black lining, zip and interfacing; I knew I was onto a winner. The pattern is super simple, very suitable for a beginner, or someone wanting a quick project. It also meets two of my goals for 2013: to sew clothes inspired by Boden and to make clothes appropriate for my lifestyle ( A line skirts are much easier to wear than pencil skirts). There are some lovely summer versions of this skirt in the new spring catalogue so I will be making a few more of these in the coming months. 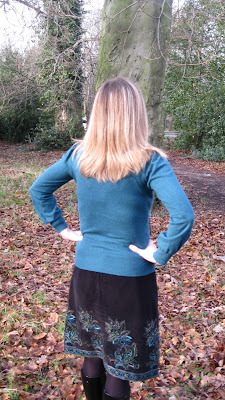 The only alteration I made to the pattern instructions were to use seam binding at the hem. There was hardly any hem allowance beneath the embellished section and I thought seam binding would add a little length and weight. I am not sure I pulled the seam binding taught enough and it is a little wrinkled but this is not noticeable from the right side. I really like your skirt! So pretty and it looks really wearable, too. Thanks Cayt. I have worn it all day and it is really comfy.